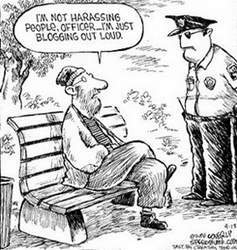 You have Blogger? Turkey has Blocker! First, it was Wordpress. Then YouTube. And now Blogger, world's largest 'free' blog service, is blocked or banned in Turkey. Why? What difference does it make? What's next? The Internet? Since today, whoever tries to access Blogger or any *.blogspot.com domain from Turkey will get the (above) message on (their) screen. This is the same message we get if we try to visit YouTube, which is also banned in Turkey. In the past blogging platform Wordpress.com has been banned as well, to much dismay of many Turkish bloggers. Turkey’s EU ambitions seem paradoxical to the infringement on the freedom of press and speech of its citizens, residents and visitors by banning sites like this. This is not China. This has to stopped. Good thing the EU’s making a blacklist of censoring countries and are creating software for people in censoring countries to use to overcome the censorship (Global Online Freedom Act).